Here are some stunning pictures of Thornham Marina in the beautiful Chichester Harbour taken by Jeanette this morning. Send in your beautiful snowy pictures to info@thornhammarina.com and we'll publish them too! For those of you who were unable to make it to the annual Thornham Marina BBQ (based in Chichester Harbour), here is a little video of the day. 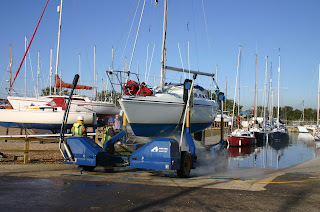 Do you have a small business within the Marina industry? Are you looking to boost your profit and increase the exposure of your small business by setting up a base at an established Marina? 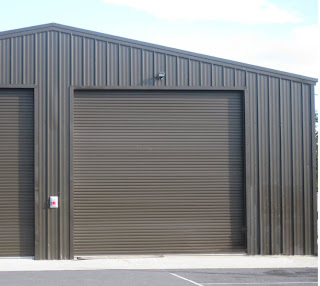 Thornham Marina has two buildings available for lease. Nearly new, 1500 sq ft (approx) available for lease. 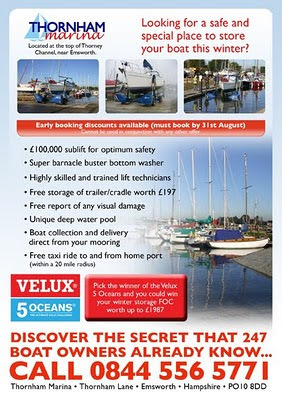 Ideal for someone involved with boat repair/restoration/manufacture. 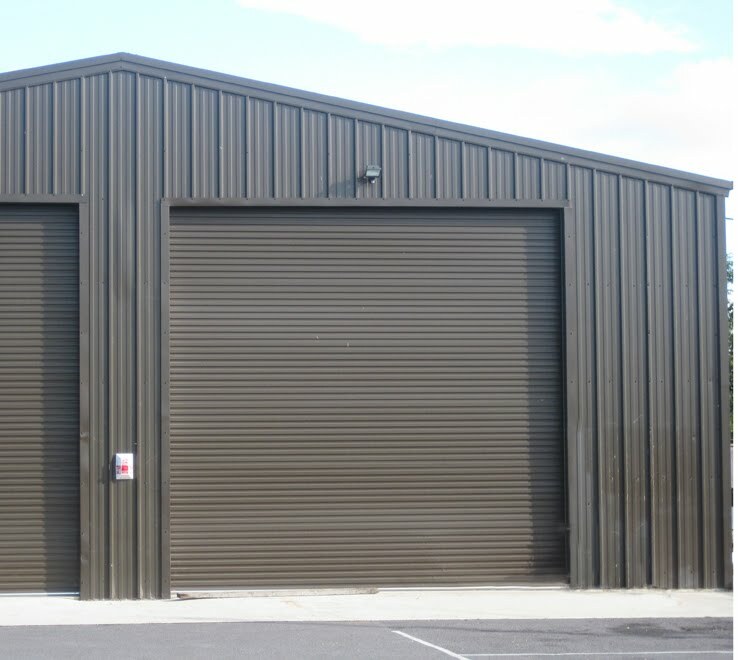 Small portacabin approx 10ft x 20ft available for lease. 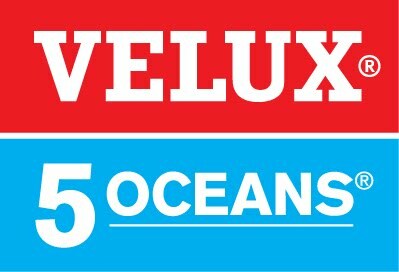 It would be suitable as an office for a marine brokerage, an electrician or a small business within the Marine industry. We are looking to enhance our thriving marina by expanding on the services to our customers, introducing a new tenant to base themselves at Thornham Marina within Chichester Harbour will mean that customers have everything they want all in one place. If you are interested in this offer or would like further information then please contact Jeanette the Marina Manager on 01243 375335 to discuss this further. Moorings at Thornham Marina in the Beautiful Chichester Harbour. Hello everyone! Spring is finally here and what a perfect time to come and explore the beautiful Chichester harbour and what is has to offer. Thornham Marina lies at the top of Prinsted bay in the idyllic surroundings of Chichester Harbour, with its breathtaking views and 10 minute walk from the picturesque and bustling village of Emsworth, Thornham Marina is a wonderful location to moor your boat on either a pontoon berth or a swinging mooring in the channel at a very competitive price. 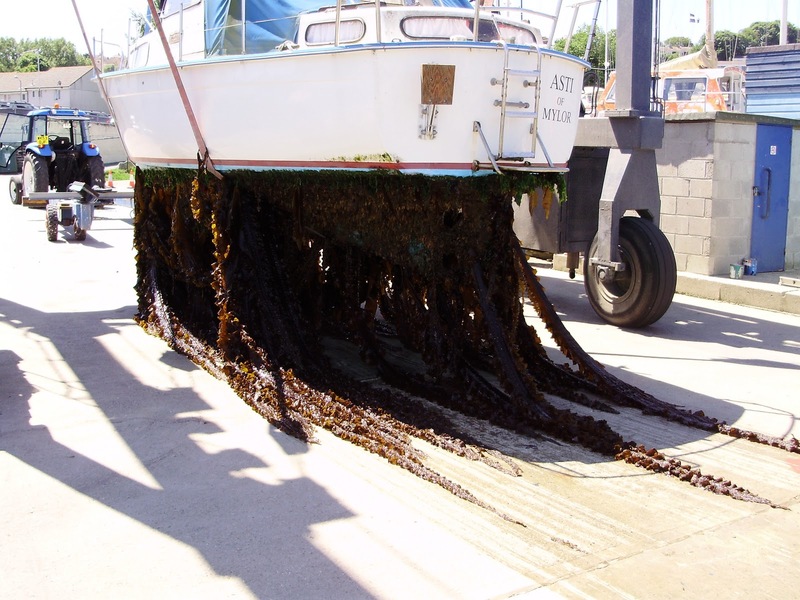 Why not phone us now on: 01243 375335 for a quote and see for yourself how cost effective it is to moor your boat at Thornham Marina, you wont be disappointed! If your planning on visiting Chichester harbour soon then why not moor your boat on one of Thornham Marina's visiting berths for the day and have a drink and a hearty meal in Boaters bar and restaurant that we have on site. Or venture into Emsworth for fantastic shopping, pubs and restaurants. There are also many lovely walks to explore around Emsworth which cut across the shoreline and farmland providing attractive views of the water. Take time to stop and admire the view. There's plenty to see and do in Emsworth and the surrounding Chichester harbour, so you can see why Thornham Marina is the perfect getaway for you and your boat. 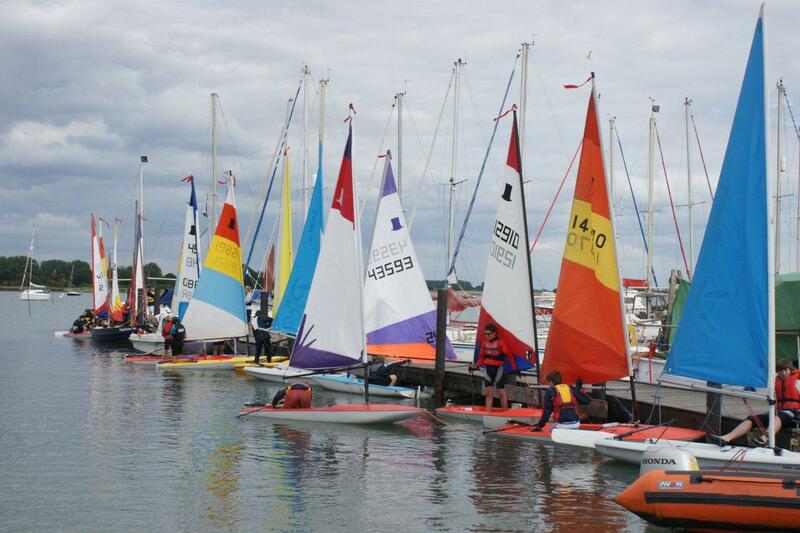 Come and see what Chichester Harbour's best kept secret could offer you and meet the friendly team. 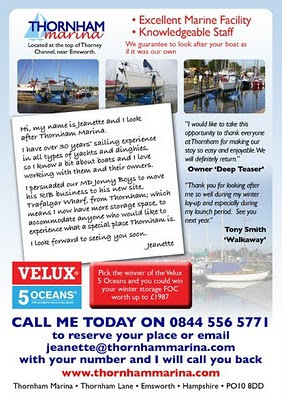 Call Jeanette or Laura now on 01243 375335 or send us an email at info@thornhammarina.com and we will get back straight back to you. 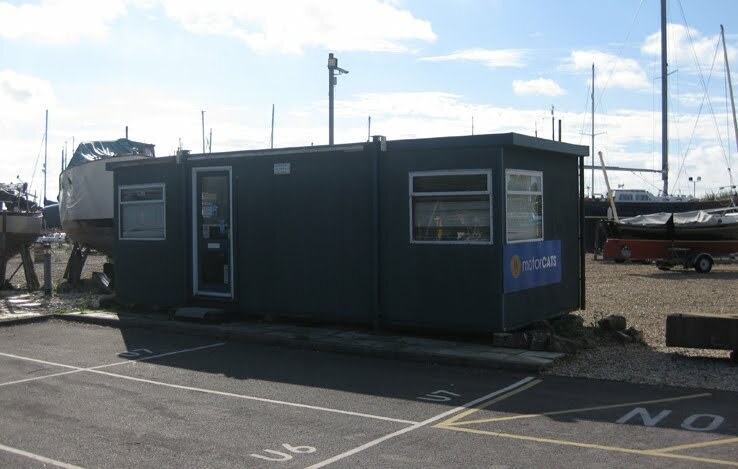 Thornham Marina have a small Portacabin approx 10ft x 20ft available for lease which would be suitable as an office for a marine brokerage, an electrician or a small business within the Marine industry. We are looking to enhance our thriving marina by expanding on the services to our customers, introducing a new tenant to base themselves at Thornham Marina within Chichester Harbour will mean that customers have everything they want all in one place. Here at Thornham Marina we are always looking for ways to improve on the service we provide to our boat owners so we are pleased to announce that a new tenant is coming on board with us. 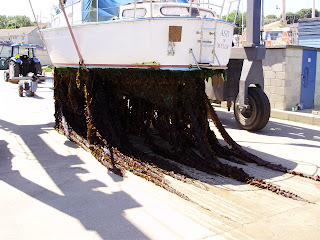 Barry Locke who specialises in Reefing and Rigging will be based at Thornham Marina, and will be with us by July 2010 to add to our existing repair services. Barry has a proven track record in this area and worked for 20 years for Roto Stay. He then moved to Port Solent where he worked with Leaning Masts and Rigging. Barry has more recently decided to go self employed and we are pleased that he has chosen Thornham to base himself. 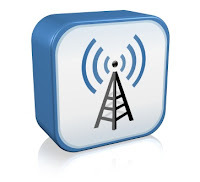 You can contact Barry on his Mob: 07970772686 or 01243 376064 or email him at barry.b.j.locke@btinternet.com. If you are looking for a Stainless Steel Fabricator, welder and polisher and someone who can do Alloy welding, then look no further. Our man Rob is based only 10 minutes from Thornham marina will be able to help. If you need Rob’s services then you can contact him on his mobile 07811157310. We have exciting things happening at Thornham this year so log on to the blog regularly to keep yourself updated. May is a busy month of the year for Thornham Marina, have a look what else is going on in Chichester harbour this month for you to take part in.We have a list from the Conservancy below of the variety of events and walks Chichester harbour have on offer. All sorts of subjects are covered from photography (2 May), to Gardening (23 May) and Fishing (29 May). Come aboard the restored Victorian oyster boat Terror for a 2 hour sailing trip from Emsworth. £12.50 adults, £5 children. For dates and times and to book please call 01243 513275. After an introduction indoors, we will explore the shoreline with our digital cameras. Bring your own camera (check that you have enough battery power for the session), outdoor gear and footwear for muddy conditions. Safety briefing 10am prompt. Fee: £5 per person to include refreshments, BOOKING ESSENTIAL on 01243 512301. Come onboard the Solar Heritage to hear fishy tales of days gone by. All tickets to be booked in advance on 01243 513275. Come onboard the Solar Heritage to see Chichester Harbour Area of Outstanding Natural Beauty. With general commentary. All tickets to be booked in advance on 01243 513275. Introduction followed by a shoreline scavenger hunt to obtain materials to create a piece of artwork inspired by Chichester Harbour. We’ll then work in the classroom. Basic materials will be provided but you might like to bring a supporting base for your work. Bring outdoor clothes and footwear for muddy conditions. Bring a small bucket for your finds and a packed lunch. Fee: £7 to include refreshments, BOOKING ESSENTIAL on 01243 512301. An opportunity to look closely at the surprising variety of building stones found in Apuldram Church in the company of local geology enthusiast David Bone. Come onboard the Solar Heritage to hear more about the wildlife of this unique area. All tickets to be booked in advance on 01243 513275. A stroll around Hayling Island’s Sandy Point Nature Reserve looking at the distinctive plants and animals of the coastal heath and sand dunes. 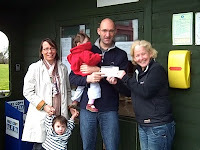 With Hampshire County Council’s Countryside Rangers (tel. 02380 402534). An introduction to print-making inspired by Chichester Harbour with Fran Davies, artist and Conservancy teacher. All materials will be provided. A short presentation indoors in our classroom on the locations of the official and permissive paths that are suitable for wheelchairs. Followed by complimentary refreshments. 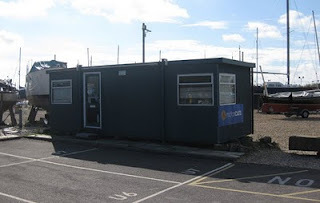 The safety barrier onto the quay will be left raised for access and parking next to the classroom but please note that the surface is gravel and the quay has a shoreline location. A 5 mile (8 km) walk from Langstone along the Chichester Harbour shoreline to Emsworth, returning via the hamlet of Warblington after half an hour’s break for an optional cafe stop in the village. Please note that some of the route is along shoreline shingle. An introduction to how you can manage your garden in the Chichester Harbour countryside with respect to the natural environment and landscape. To include an overview of the protected habitats of the harbour area, and suggestions on what to plant. Find out what you need and what you do, and then do some fishing from the quay. Bring any fishing gear that you have but if not we will have some rods to share round. Dress warmly. Refreshments available for a small donation or bring a picnic. For all ages. 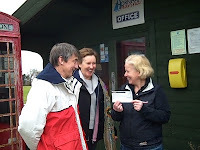 With Allan Blamire and members of Apuldram Fishing and Boating Club. Safety briefing 10am prompt. Explore the harbour onboard the solar-powered Solar Heritage. Leave the boat at Chichester Marina and then walk 3 miles (5km) through harbour countryside back to the start. Dress warmly and bring refreshments for the boat trip.